I am excited to share that we are up to $335 on our way to $1,800. THANK YOU! I am so excited that with YOU, we can get “I Am More Than Just a Girl” published by April. So…… where are the funds coming in from? $5 from Zahira Tiara S.
Here is a list of ways you can help distribute 150 books to youth organizations across the USA. Feel free to pick as many actions as you like. If you have any questions about these actions just ask. Your support is greatly appreciated and will have a powerful ripple effect of empowering young women. Below is a picture of the book cover that you can share along with the fundraiser information. Send this text below as an email and ask your friends to also send this email. 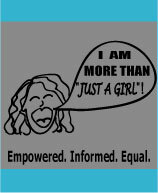 Want to help publish this great book, I Am More Than Just a Girl ? It provides resources, information, advice and creative exercises to empower women with the knowledge to make their own informed decisions. I won’t go into depressing statistics of how often young women are abused, assaulted and oppressed. You don’t need me to remind you that until recently women had very little rights as equals and in some countries are still considered objects that can be owned. Society encourages us to be outwardly successful, to make lots of money and then we will be happy. We are not often encouraged tofind inner success in the forms of knowledge, happiness and emotional health. An important part of life is to help others feel empowered. We need a total of $1,800 to accomplish our goal. Shout it out on your Facebook pages, donate $5 online or send a check (email: investing in women@ gmail .com for the address). Visit, http://morethanagirl.webs.com to see what perks you will receive for helping publish this important book. If you will join, our goal is to raise the full amount by the end of March. Read the book for free and pass it on! Share it with parents, aunts, uncles, grandparents, older sisters and brothers, teachers, community leaders, youth organizations and young women. Now is the time to take action! We can no longer wait for someone else to empower the next generation of women. As the saying goes, YOU must be the change you want in this world. If you believe this book is a must have for young women, get involved today. To follow the progress of the campaign subscribe to the authors blog(https://writewhatuknow.wordpress.com). Pass this on to 10 other people and together we can make the world a brighter place.